Foot fungus is an infection of the foot and is also commonly referred to as athlete's foot. Although some people have a higher risk of developing foot fungus than others, the condition can afflict virtually anyone when the environmental conditions are right. Unfortunately, a variety of misconceptions surround foot fungus. However, with a better understanding of the condition, it can be easier to prevent and treat. Here is a look at some of the real facts about this common problem. Foot fungus can affect anyone. Since it's called "athlete's foot," foot fungus might seem to be a condition that only affects those engaged in sports. In reality, the condition is only more common among athletes because their activity levels cause sweating that results in the damp conditions that foot fungus prefers. However, it is important to note that these conditions can be found outside of sports as well. A full day of wearing closed-toe shoes, for example, can result in enough moisture for foot fungus to flourish. Likewise, any bathroom or shower can harbor the fungus if cleaning is not performed frequently enough. Foot fungus affects more than bare feet. Even if someone avoids walking barefoot at all times, that person may still develop foot fungus if he or she is exposed to the pathogen. This can occur in a number of ways. Because the fungus can remain on towels, socks, and bathmats, walking on any of these surfaces can result in a case of foot fungus. 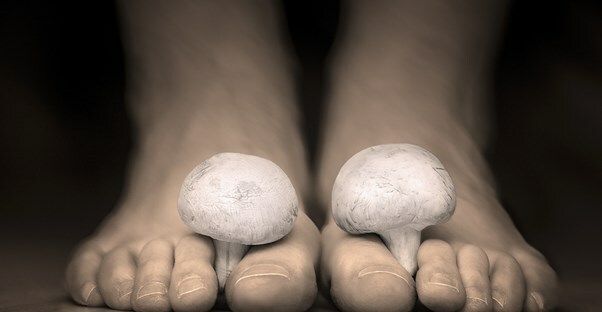 Furthermore, even touching a surface containing the fungus and rubbing the feet afterwards can result in infection. Finally, socks or shoes that are frequently damp but infrequently cleaned can maintain fungal populations and can cause or extend foot fungus infections with regular wear. Foot fungus can't be completely eradicated. Cleanliness is bound to reduce risks of a food fungus infection, but it is not likely to completely prevent it. A person who bathes on a daily basis may get and continue to suffer from foot fungus if that person's feet are damp often enough. This is particularly true when a person bathes in a communal shower, as the floors in such facilities are likely to harbor the fungus. Risks can be reduced by thoroughly drying the feet, including between the toes, after bathing but before putting on socks and shoes. Foot fungus has multiple symptoms. Foot fungus is strongly associated with red splotches that constantly itch, but symptoms can actually vary between cases. For example, skin may seem drier and may peel in some cases of foot fungus. Others may develop blisters in the infected area. Additionally, the fungus behind these infections, tinea pedis, is also strongly associated with fungal infections on other areas of the body. For example, the fungus associated with jock itch, tinea cruris, causes a rash to develop in the groin area. Ringworm, or tinea corporis, can also cause fungal infections resembling stereotypical foot fungus on virtually any area of the body. Many people with foot fungus also develop a fungal infection of the toenails that results in nail yellowing and breaking off. Foot fungus is thought to be treatable with the right product, but the condition does not necessarily go away so easily. While certain treatments may reduce the problem or resolve it temporarily, foot fungus can stubbornly reappear later with the familiar symptoms. Ultimately, the best way to control foot fungus is to keep the feet clean and dry as much as possible. A healthy immune system and sufficient blood flow to the feet may also help prevent the condition from worsening or spreading.